The Academy of Ideas and Salford City Council are delighted to announce the Debating Matters Salford Championship supported by Capital & Centric and hosted by venue partner The Lowry. Debating Matters is pleased to reveal a flagship Championship to be held at The Lowry on Monday 9 July 2018. Twelve schools from Salford and the surrounding area will have the opportunity to battle it out for the crown of Debating Matters Salford Champions as they tackle a range of difficult topics over the course of a rigorous day of debate. 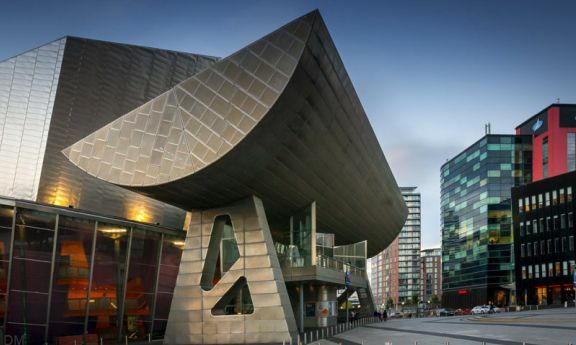 Partnering with Salford City Council and supported by award-winning property developers Capital & Centric, The Lowry will play host to some of the North West’s sharpest young minds. The Lowry is a spectacular waterside building housing theatres, galleries, restaurant, café/bars, and a gift shop with facilities for weddings and corporate hire. If you are a school or college and you would like to take part, please register interest ASAP as places are limited. Email Bernie Whelan at berniewhelan@academyofideas.org.uk for all the details and an entry form. You can also contact Bernie with any other queries you have in relation to the event.